The event occurred simultaneously to and on the grounds of - Cambridge's Danehy Park Family Day. Thousands of families attended the event, passing by and/or engaging with the EV event. 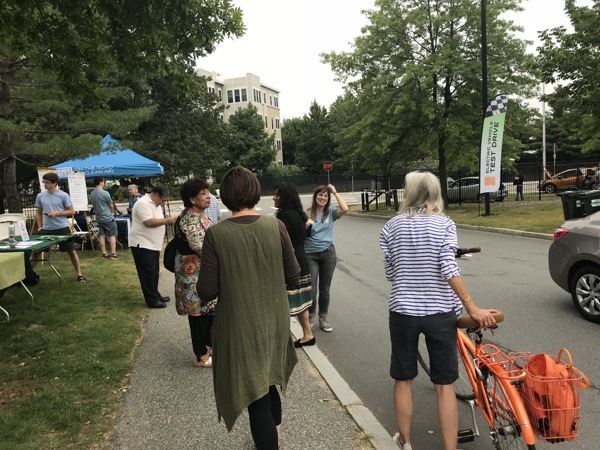 The ride & drive portion of the event was sponsored by a local utility (Eversource) employing the help of a communications strategy firm (Reach Strategies). Local environmental groups, consumer alliances, dealerships and EV enthusiasts helped further enrich the information and personal accounts available at the event. In addition to the multitude of families, athletes, and park goers who attended, there were also City Council Members and City Department Division Directors. A class of local college students attended the event and held interviews with EV owners and advocates. It was a very successful day! Bronwyn Cooke (City Captain) greets Vice Mayor Jan Devereux, as folks sign up for test drives. A Chevy Bolt and Nissan Leaf are being displayed in the background. Come celebrate National Drive Electric week with us at Danehy Park Family Day. * Test drives are on a first-come, first serve basis with a valid driver license. If you want to know what it's like to own an EV, there will also be EV owners that you can chat with, and hear what their experience has been like. Registered attendees report 289,446 electric miles driven.